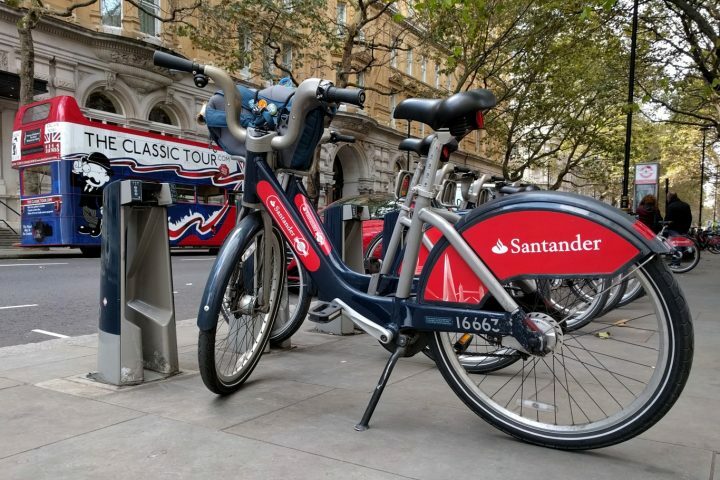 I had the opportunity to try Santander Cycles in London during my visit in October 2016. The first thing that became apparent was their station distribution. 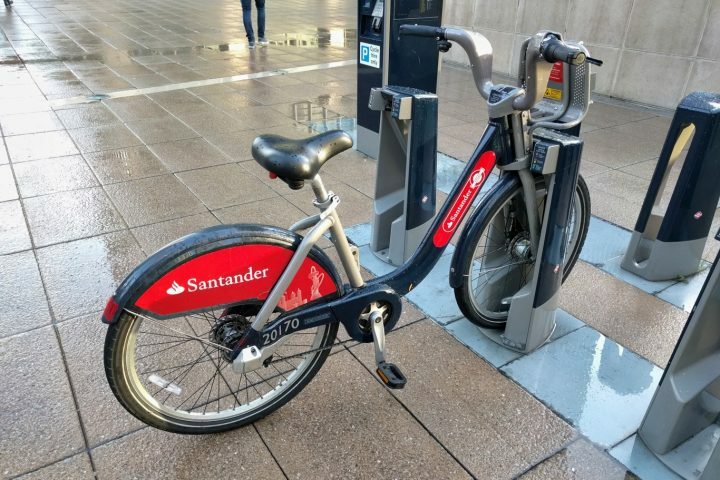 Santander has peppered stations all throughout the service area and they rarely have no bikes, making it easy to take advantage of their daily pricing system: £2 for 24 hours of unlimited 30 minute rides. It’s easy to station hop a longer trip in order to stay within the 30-minute limit. Each subsequent 30 minutes after is a £2 charge. But keep in mind the 5-minute cool-down after docking your bike back. With some planning, users can dock then continue on foot to the next station. Each station has a kiosk to facilitate signing up and checking out bicycles. Once signed-up, you only need to swipe your credit card to checkout a bicycle. The kiosk prints a 5-digit code of which you use to unlock the chosen bike. I thought it was a bit redundant that you had to pick a bicycle first then enter a dock number. 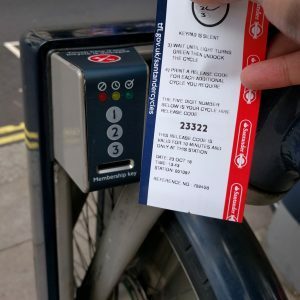 But perhaps this facilitates bicycle reservations from another medium like a mobile app, or allowed users to pre-inspect their bikes first. No surprise the bicycle is heavy, reinforced for the rigors of shared bike use. For most riders, the bike won’t be difficult to get going. The 3-speed shifter is also one of the smoothest among bikeshares — no chain play between shifts. The open basket won’t hold loose, small items, but it secures small luggage like backpacks exceptionally well using elastic bands to hold down and secure items. For travelers heading to London, the London Underground subway is already a treat to use. 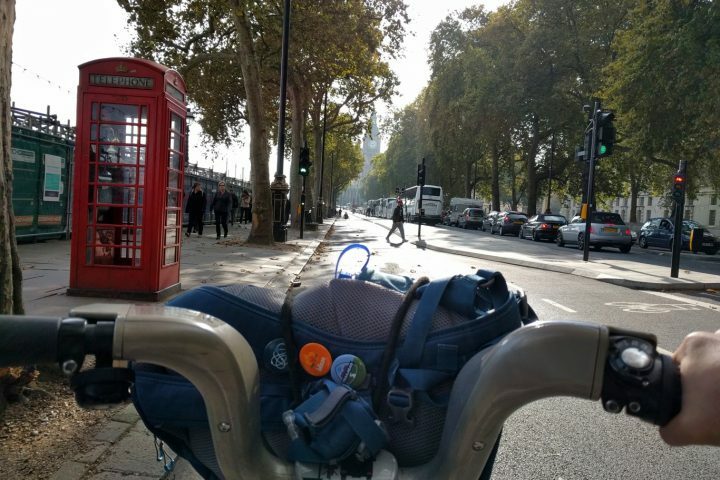 But cycling is another good alternative to get around and tour the city. 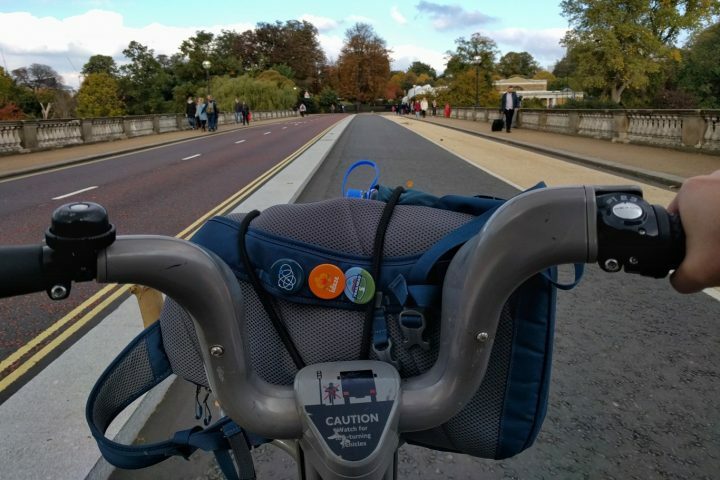 Dedicated bike lanes can be found throughout the city but many paths require riding alongside cars and buses. 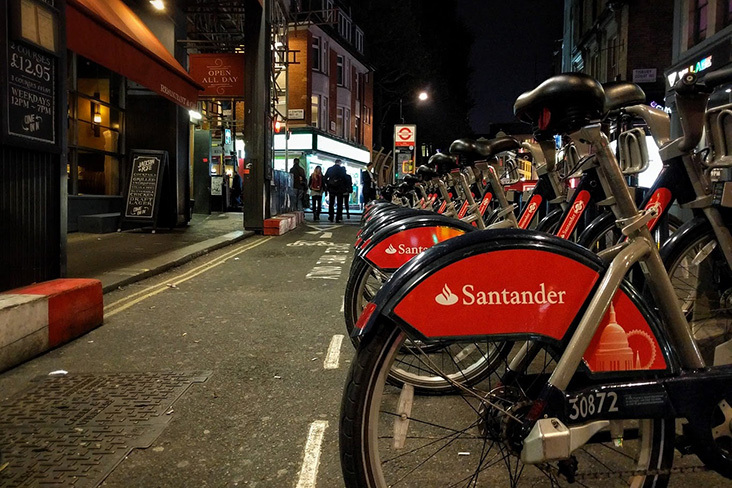 Santander Cycle’s pricing is as straightforward and inexpensive as it gets. And the sheer number of bikes and stations makes it easy to get from one attraction to the next, while taking in the city sights. Numbered markings on the seatpost is essential. Following the river Thames; Big Ben up ahead. Fenders included for weather like this.